After Lila and Blue we looked for young rats again. We found a girl in Dachau who had young rats. Originally we planned to adopt two, but once we saw the small animals we decided to take one more. Their names are japanese terms: nami means wave, sora means sky and yuri means lily. Nami was a husky who was dark grey when she was young but quickly turned light grey. Sora was an albino and Yuri was also a husky, with a stripe on her back. That was also her nickname: "Streifen" (stripe). 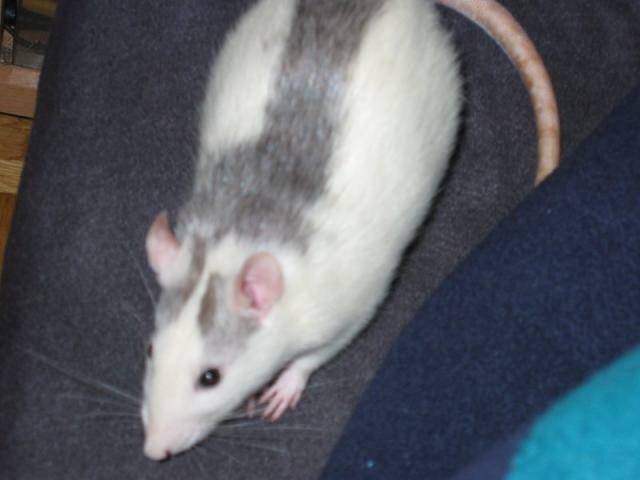 Rats are very social animals and we won't be having less than three rats again. Keeping a solitary rat is cruel, and even two are too few. Three looks like a good minimum number. The three were very confiding. Especially Yuri loved our company and liked to be petted. Nami was cheeky while Sora was very calm. Being an albino, Sora had severe eye problems and was almost blind which didn't seem to bother her much. Luckily eyesight is not as important to rats as it is to us humans. All three had long rat lives. Yuri had cancer but luckily we found a good vet in Gauting, a city near our home (I grew up in Gauting). 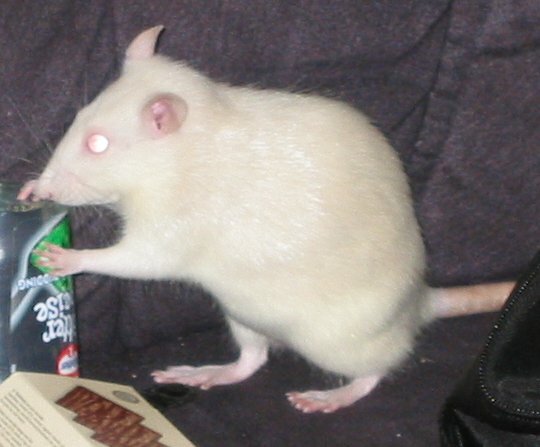 Not only did she know how to treat rats, she had some herself at a time. She's also very friendly and committed. 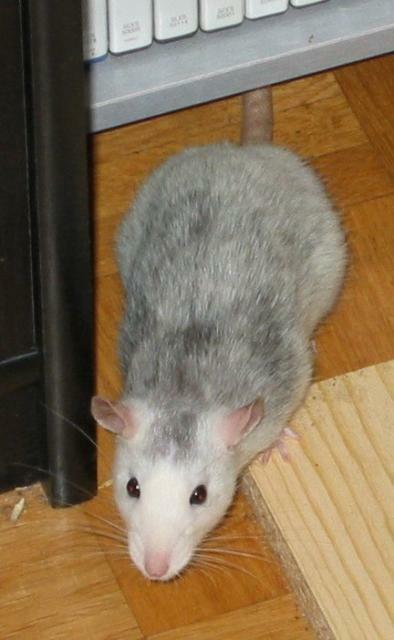 Yuri was the first of our rats that was treated by her and since then she's the vet we trust. Unfortunately Yuri grew another cancer a few months later. We didn't want to have Yuri suffer an operation again so we decided to have it untreated as she already was well over two years old. Eventually we had her euthanized as the cancer grew too big. A few months later, Nami had trouble breathing. Most likely she suffered from lung cancer. Eventually we had to have her euthanized as we noticed that she was really suffering. Sora was lucky to have had a good health. She became an old lady and eventually we had to have her euthanized when she started to refuse eating. By that time we made a new home in a box on the floor as she was already so weak that she couldn't climb any more. But she was a fighter and lived in the box for several months, like Arwen.